Few people other than Richard Smalley and like-minded nanotechnology researchers understand Buckminsterfullerenes (buckyballs) and nanotubes. Those who do say they are small, strong, and have tremendous potential for impacting science in the near and distant future. Rice University Professor Smalley, recipient of the Nobel Prize in Chemistry in 1996, will speak at Sam Houston State University April 9 as part of the university's Distinguished Lecturer Series. His presentation is scheduled for 2 p.m. in the Olson Auditorium in Academic Building 4. Smalley has indicated that his topic at Sam Houston State University will be energy, with the United States having entered a war in Iraq and oil prices showing instability. "We have to somehow wean ourselves from our dependence on oil," Smalley said. "The sooner the better." It is a concern not only for the United States, he said, but the world. "The problem is not just oil," he said. "Somehow within the next few decades we must find a new energy source that can provide a minimum of 10 terawatts (TW) of clean power on a sustainable basis, and do this cheaply." To do this with nuclear fission would require no less than 10,000 breeder reactors, Smalley calculates. "Assuming we don't get it all from nuclear fission, where is that 10 TW of new power going to come from? Who will make the necessary scientific and engineering breakthroughs? Can it be cheap enough to bring 10 billion people to a reasonable standard of living? Can it be done soon enough to avoid the hard economic times, terrorism, war and human suffering that will otherwise occur as we fight over the dwindling oil and gas reserves on the planet?" He believes that energy "may very well be the single most critical challenge facing humanity in this century." 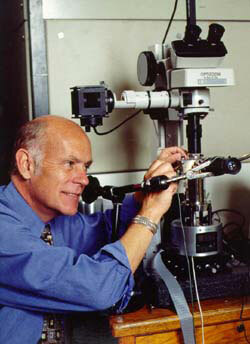 Smalley first became known for pioneering research when he and colleagues at the University of Chicago developed what has become one of the most powerful techniques in chemical physics--supersonic beam laser spectroscopy. He has since received the Nobel Prize in Chemistry for his nanotechnology research in collaboration with Rice University researcher Robert Curl and Harold Kroto of England. Smalley founded the Center for Nanoscale Science & Technology at Rice and continues to do research there that is on the sharpest cutting edge of national and international science. He is also chairman of the board and co-founder of Carbon Nanotechnologies, Inc., which produces fullerenes for commercial use. Nanotechnology involves the development of tiny, artificial materials, atom by atom. The nanotubes are hollow, cylindrical carbon fibers that are 10,000 times smaller in diameter than a human hair and 30-100 times stronger than steel--"the stiffest...object in the universe," according to Smalley. Chemists, physicists and engineers say nanotechnology may revolutionize the properties of plastics, oils, and textiles, giving them breathability, heat resistance, strength and flexibility. Medical scientists believe they may give doctors tiny mechanized tools that could wipe out cancer cells and treat other diseases. While most applications may be many years away, Smalley predicted a year ago that within five years nanotubes will be used in commercial products. Smalley, 59, was born in Akron, Ohio. The principal impetus for entering a career in science, he said, was the successful launching of the Soviet Union's Sputnik in 1957, and the belief that "science and technology was going to be where the action was in the coming decades." He attended Hope College in Michigan, the University of Michigan, and Princeton University. He worked as a research chemist before joining the faculty at Princeton and also worked in the James Franck Institute at the University of Chicago before coming to Rice University in 1976.